This week I’ve got two necklace projects on the go, plus a necklace tutorial on the back burner that’s coming along slowly but surely. This week’s mini collar features long magatamas and large dagger beads. I’m trying out a new layout for drops, and if it works it might become a new favorite. The fringe necklace with coconut daggers is still underway. It’s been awhile since I’ve done any scalloped St. Petersburg chain – if forgot how long it takes to add all those individual loops of fringe. I have a feeling that this necklace won’t be finished for quite some time, but it’s nice to have a back-up project to work on between other pieces. I did have the beginnings of a new ugly necklace for that, but it’s been all but forgotten thanks to all of the new inspirations I’ve found in the past few months. I'm really enjoying the palette for this week's mini collar, although I did end up having to add in a second seed bead color to make the netting work. It's still very early in the challenge, but I'm already having trouble decided how to proceed. Should I comb through my drops stash and just start building palettes around the wants I want to use up, or pick accents and random and see what happens? There are just so many choices it's hard to know where to begin, which is really why I wanted to do this challenge in the first place! What with my latest blue coconut dagger project and the cool spring weather we’ve been having in my area, I’ve really been in the mood for warm colors and anything that will make it feel like summer. Tropical themes are always great for adding a little spice, and offer plenty of options for inspiration. There are colorful flowers and fruits, and gorgeous blue waters to draw on – everything looks better and brighter when it’s illuminated with bright sunlight. This week I wanted to capture that warmth with seed bead palettes. To start I went with florals, using three sweet, saturated colors. To make Island Lei I combined a most cheerful shade of purple - wisteria lined crystal – and aqua white-hearts for that touch of intense light and ocean blue. Gel sol pink topped everything off with just the right amount of sugariness. Naturally, I had to start at least one palette with intense yellow, so I grabbed some opaque canary 8/o’s. I wanted some equally bold hues to go with it, so next came opaque vermillion red. I haven’t really had a chance to use this color yet, but it’s a perfect match for the yellow. Passion Fruits is finished with lustered orange sherbet, though I would have preferred a more peachy or pumpkin-y orange. Finally, I had to go with a palette to represent my favorite tropical flavors. 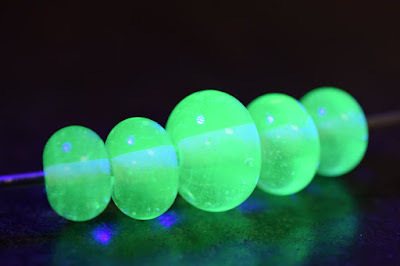 Coconut Lime includes some transparent lime green long magatamas, and opaque white 8/o’s. The lovely brown of transparent dark topaz seed beads looks gorgeous with the green and definitely brings out the coconut in the white beads. Delicious! What’s your favorite tropical inspiration? It’s rather unfortunate that we can’t devise a way to have all of our favorite beads on tap, with a never-ending supply of them ready to use at the touch of a button. Because even bulk beads come in a finite quantity, only to be replenished on our next trip to the bead store, leftovers are a common occurrence. 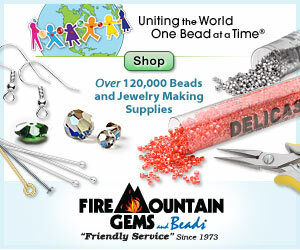 If, like many beaders, you also tend to purchase new types of beads on a whim, they are even more common. The last few grams of seed beads, or the last bead or two on a strand have a tendency to hang around, too low in quantity to make their way into a design. Even if you purchase beads specifically for each project, leftovers can happen. There are two major downsides to having leftover beads: they take up room in one’s stash, and they have a tendency to drag down our reserves of creative inspiration. 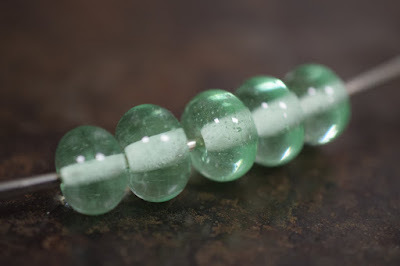 Leftover beads can seem to call out “why haven’t you thought of a way to use me, yet?” Short of sweeping all leftovers into a broom bead box and shutting them away in a dark cupboard, the only solution is to just go ahead and use them up. Here are 5 fun ways to put those pesky hangers-on to good use. All you need is a bit of chain and a pile of headpins, and you can eliminate almost any assortment of random accent beads from your stash. They don’t even have to match! In fact, the more eclectic, the better. 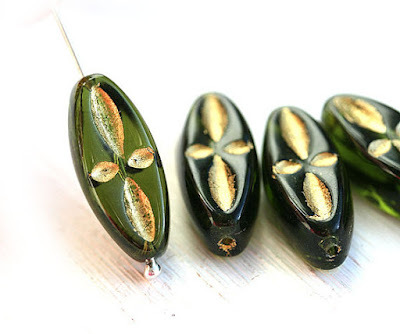 Of course, if you do want to turn a motley crew of beads into a polished looking ensemble, you can always sort them by color, shape, or size and attach them in a pleasing pattern. The sorting method would also work for a quick pair of asymmetrical earrings. By creating a visual relationship between two piles of beads, you can make a pair of earrings that looks like a match with a twist. Whether it’s traditional bead embroidery, soutache, or shibori, random beads are perfect for these kinds of projects. 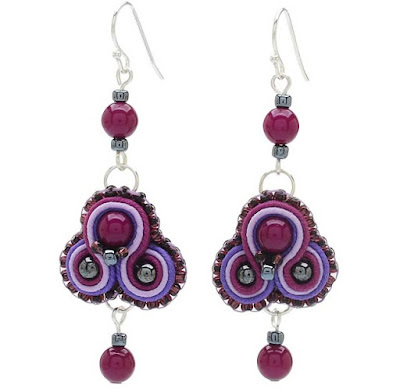 If you have multiples of some beads, you can make matching earrings. Otherwise a pendant or cuff is the perfect place to showcase not only your leftover accent beads, but those random few grams of seed beads as well. In any embroidery method, one or two accent beads is plenty, so this is a great way to use up just a handful of leftovers. Seed bead addiction is no laughing matter, especially when it means that we end up with so many packets and tubes of colors that lost their appeal after the first project. When these seed bead leftovers start to pile up, it’s time to make use of stripes and geometric patterns. Luckily, abstract designs and multicolor palettes have become super trendy for jewelry lately, and of course the possibilities are endless. When mixing and matching multiple bead colors without even glancing at your color wheel, a strong neutral can really help to bring everything together. 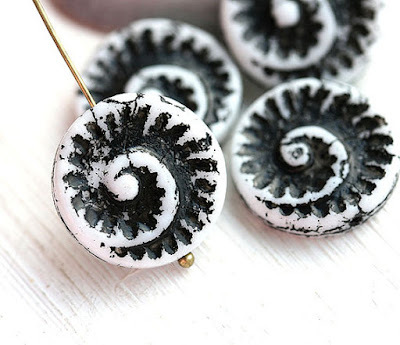 Try incorporating opaque black or white for at least a quarter of the beads in your project to get a nice, cohesive look. Many beaders feel a bit intimidated by freeform beadwork. It’s hard to work without a net, but the results can be amazing. The nice thing about leftover beads is that we’ve already lost some of our attachment to them – otherwise we’d be restocking and they wouldn’t be leftovers at all. 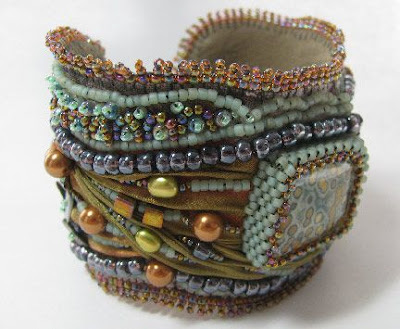 Use your random beads – alone or in a soup – to create a freeform project. 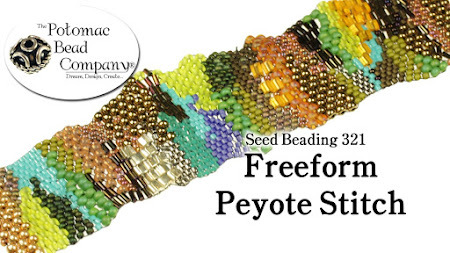 Peyote stitch cuffs are a great place to start, and there are tutorials for them everywhere. Netting and right angle weave can be easy to work in freeform if you don’t mind breaking the rules. Flat and circular brick stitch also allow for lots of tweaks that make freeform beadwork possible. Do you have a favorite treatment for leftover beads? I’m two projects in to the new Collar a Week challenge and I’ve already encountered my first snag. I was able to finish and photograph this week’s necklace in plenty of time, but now here we are on the last day of the week, and I’m much too tired to edit photos and put the piece up in my shop. I’ll have to save all of the technical work for a less full day, but I can share the design with you! I had a lot of extra things added to my plate this week, so when it came to choosing colors and patterns for this collar I had to go with something quick and carefree. I snagged the custom gold and brown seed bead mix that I made for the bead soup demo a while back and added some black and white Rizos for the trim. The soup allowed me to have a little variety without actually having to plan or choose a pattern, and the Rizos helped to add a little more of an Egyptian flair, which is always welcome. Collar number three won’t begin for another day or two, but I definitely want to play with patterns a bit next week. I was pondering adding in some peanut seed beads somehow, but I’ll save those until I’ve made some more progress with drops. For the past several weeks I’ve been puttering away at a brand new PDF tutorial for one of my favorite herringbone necklace designs. This project is great for showcasing larger accent beads and heavy fringe. I’ve used it to display everything from lampwork beads to beaded flowers, and it is the basis for some of my all time favorite designs. Even after many fun projects using this design, I've only just begun to explore the fun possibilities in dressing up the fringe. It's a great stash-busting project and a fun way to display a variety of beads. The PDF tutorial for the Chunky Herringbone Fringe Necklace is finally complete, and is now available in my shop for instant download. The tutorial project features a striking colorblocked rope and bold wood bead accents. To celebrate the first of many new tutorials this year, I’m giving away one copy to a lucky reader! 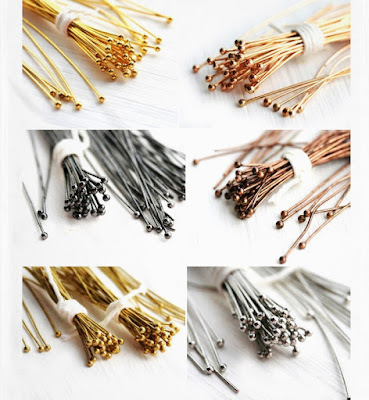 To win a free copy of the Chunky Herringbone Fringe Necklace tutorial, simply leave a comment on this post letting us know what kinds of beads you would use in the fringe. I’d love to hear your ideas! Important: Please make sure to include an email address in your comment so that I can contact you if you win! One winner will be drawn on Friday, April 29th. This giveaway is open to all international readers. 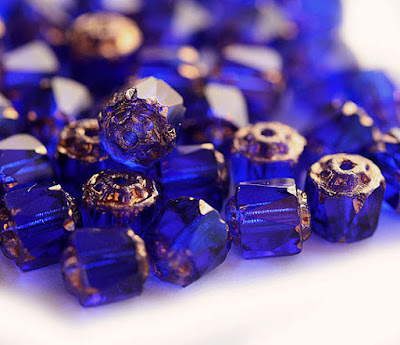 Glass beads are an invaluable material for beading and jewelry design. Versatile, varied, and affordable, glass provides a never ending source of inspiration. 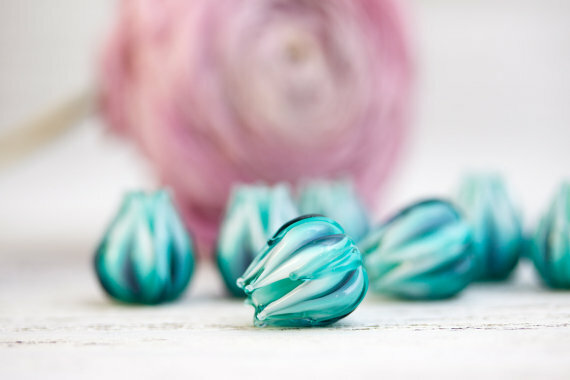 It’s no secret that some of the best glass beads come from the Czech Republic, and some of the most unique selections come from indie shops that specialize in designer Czech glass. 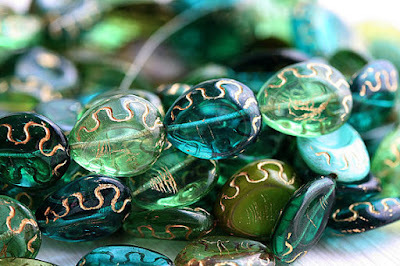 Today’s guest is Kate of Maya Honey in Slovakia– one of my favorite places to search for Czech glass inspirations. 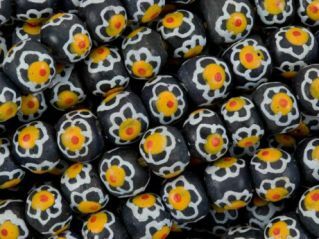 In addition to the selection of new and rare glass beads, Maya Honey also carries a variety of findings and Japanese seed beads. Kate: I’m a jewelry maker myself, I used to create a lot of jewelry pieces and made my research through different brands and types of beads and jewelry supplies. 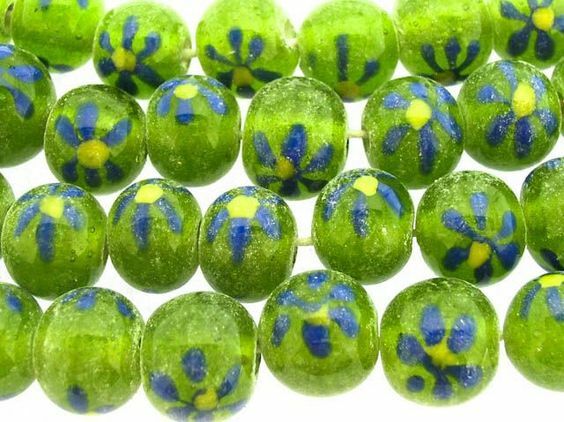 We live near Czech Republic where you can find a lot of unique glass beads. So, it was so tempting to get them all! I was getting a lot of questions about materials I used in my own jewelry and how to buy them. Also the stock was growing really fast and my husband suggested we should start selling not only my jewelry and lampwork beads but also Czech glass beads. Kate: I’m beach fan. 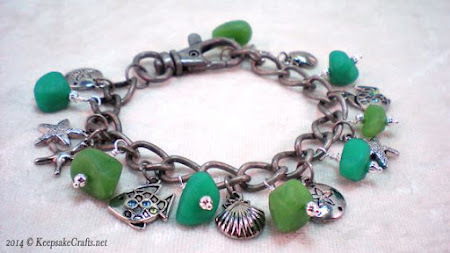 Although we do not live near the sea I adore everything concerning beach starting with all kind of teal and blue color hues in glass beads, also beach themed charms like starfishes, shells, sand dollars. 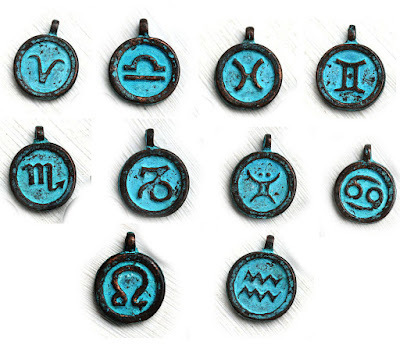 I found terrific beach related verdigris patinated charms in Greece and bought them immediately for our shop. 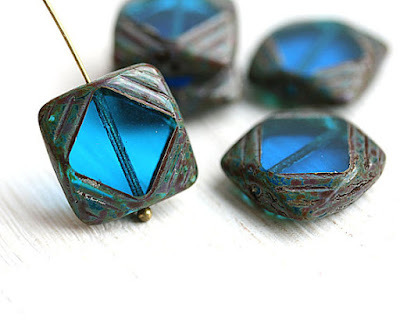 Another style I love is boho – it shows palette of rustic earthy colors, turquoise and topaz. 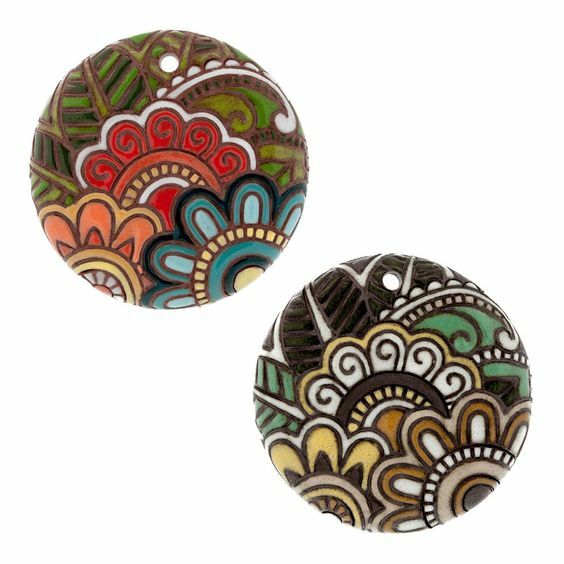 Czech glass beads with Picasso (or so called travertine) finish are perfect match for boho jewelry. 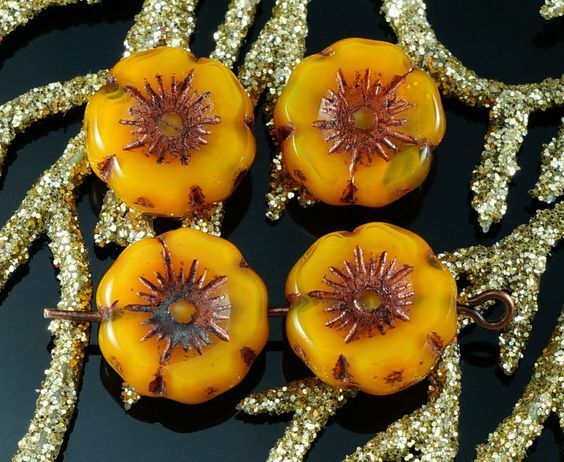 The more expensive table cut beads can be great as centerpiece for a necklace or bracelet. Inspirational Beading: What is your all-time favorite Czech bead shape? Kate: I cannot think of just one! Every season Czech manufacturers spoil us with new designs and beads shapes. 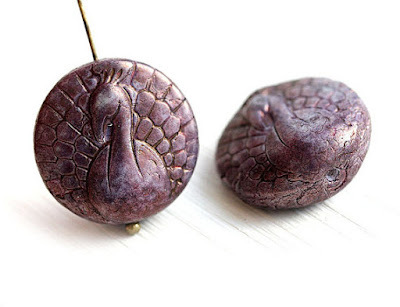 Recently I was impressed by new styles with imprinted in bead’s surface dragonfly, seahorse or bird silhouette. My long lasting love is cathedral beads, they now come not only with gold and silver ends but also with rustic earthy finishes. I can also note new Toho seed beads palette of semi–glazed colors – really natural finish. Kate: Quality! It’s always about it. You can notice that all products we carry we buy mostly in European Union. That’s because I can be sure I’m buying great product that were made using raw materials to comply with all the EU’s regulations. If it is findings they should be nickel and lead safe, leather cords of great quality, Czech glass made in safe environment and so on. Kate: We try to carry a lot of limited production beads which means we get them from family workshops in Czech Republic (sometime they don’t even have websites). It is traditional art for this region and you can find truly gifted masters of glass there. I also make my own beads mixes and bead soups – I love to make them! It’s like painting a picture really. Always happy when my customers send photos of their creations with these mixes. Kate: I’m thrilled! On my Instagram @mayahoneybead I always post photos from my customers with their creations. I sometimes envy them – they have much more time to create than me! Kate: Cannot say exactly – I love all creative things you can make with beads. I saw fantastic brooches (I never was able to make them myself) or head bands. I like adorable little toys you can make with seed beads or long very difficult to create belts. All sorts of things! Inspirational Beading: Baggies, tubes, or strands? Which is your favorite? Kate: I prefer baggies cause for me it’s easier to store and organize them. Tubes are great if you have a lot of space. I don’t really like strands cause I cut them anyway for my projects. As for the shop – I also prefer baggies. We always pre-sort all beads and materials to avoid possible broken glass, chipped beads or defects so baggies are a great choice. Kate: First, I can focus on smaller workshops where I can get very limited and unique products. I don’t think big retailer would bother for such small amount but I would. So, I look into that market, travel and find new family businesses that can offer beads and materials you will not find anywhere else. Second, our buyers say we have great customer service.And I really try to help them quick and answer all questions. 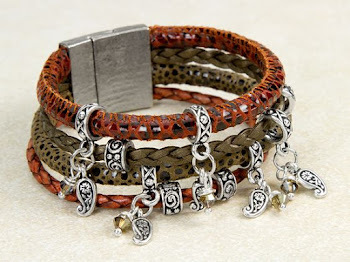 Kate: My husband and I decided to add to our shop more findings, sterling silver charms and earwires, much more colors of leather cords so you can find all in one place. Our last hint is brass ball pins (which I enjoy working so much) – we found them in Greece and now sell them in all finishes: silver plated, gold, rhodium, gunmetal etc. You can see more gorgeous hand-picked supplies at Maya Honey on Etsy and MayaHoneyBead.com. This week I’m finally going to use some of my blue coconut daggers. Probably. 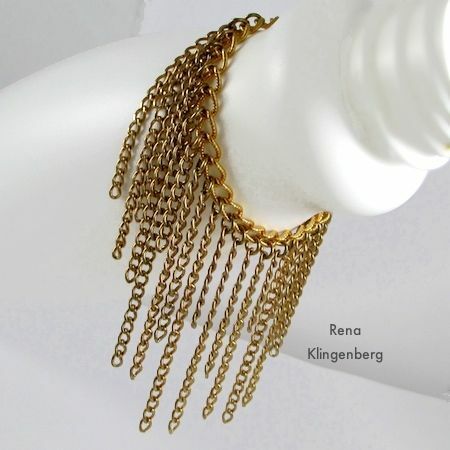 I had a great idea for incorporating them into a scalloped St. Petersburg chain necklace. I’m not entirely certain that the shape of the daggers will work with the stitch, but I won’t know until I’m more than halfway finished with the design. Fingers crossed! Even if it doesn’t work out, I needed to revisit the design again anyway because I’m hoping to create a PDF tutorial for it later this year. I’m also working on this week’s mini collar. I’ll leave all of the details for Saturday, but it is going really well so far. Although I’m only two projects in, I’m still very happy with how well the challenge turning out. I’ve got so much inspiration for my tray of drops and daggers now that I’m on a mission to use them. One of my favorite times of year has arrived – the neighborhood is covered with drifts of pretty pink cherry blossom petals, and the light fragrance of flowers is everywhere. I’m especially fond of the way the blossoms look against a cloudless blue sky. 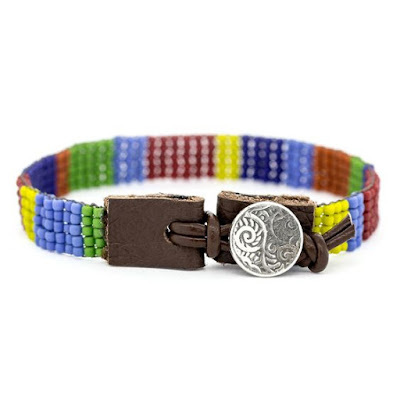 The color combination is definitely bead-worthy! 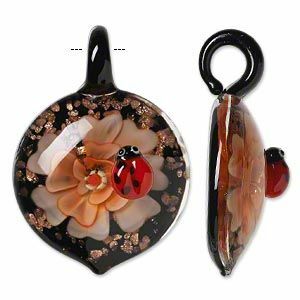 Flowers are one of those special jewelry inspirations that go around and around in a circle. 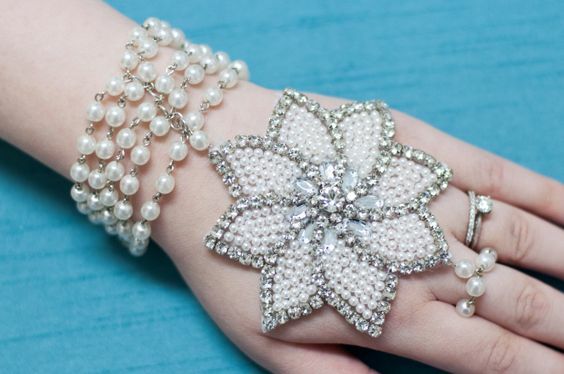 Everyone loves flowers, so there are lots of flower beads and beading patterns out there. Since they’re so abundant, flowers designs are great for inspiration, and they make us love flowers all over again. It’s also easy to use flowers as inspiration because there are just so many options. From daisy chains to orchids, the possibilities are endless. 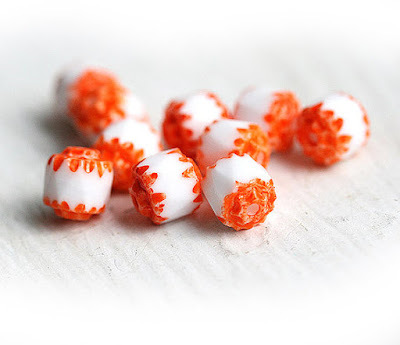 from Happy Mango Beads are irresistible! from Czech Beads Exclusive. So yummy! 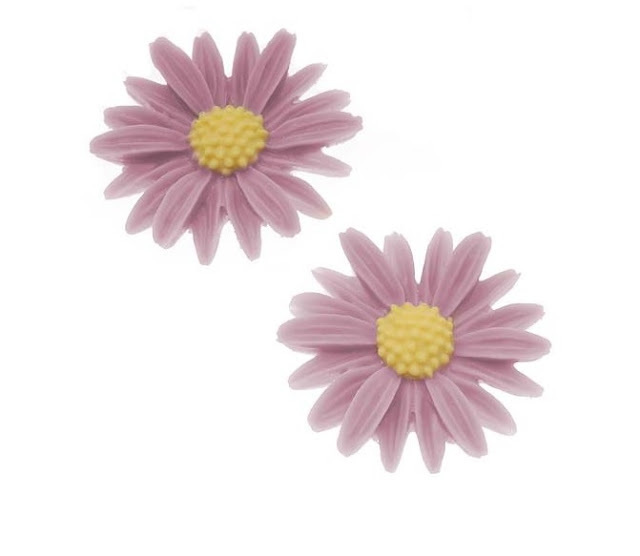 but it was these pretty Lucite daisies from Beadaholique that stopped me in my tracks. by Iveta Linde on Etsy is simply perfect! 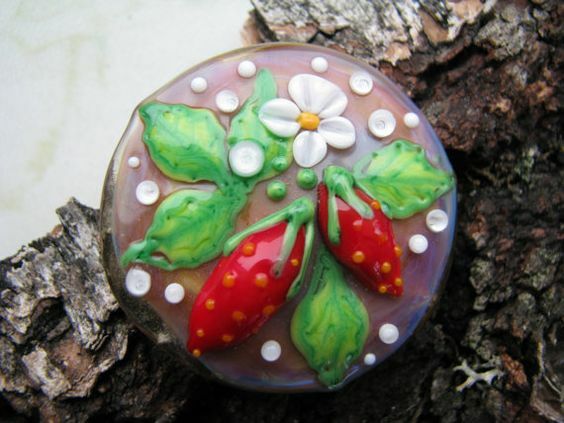 opal buttons from Ms. Bijoux Beads on Artfire. baubles from Artbeads.com is lovely. features a totally adorable ladybug! What could be more inspiring than the amazing motifs of Golem Design Studio focals? by Solar Salamanders on Etsy don't disappoint. 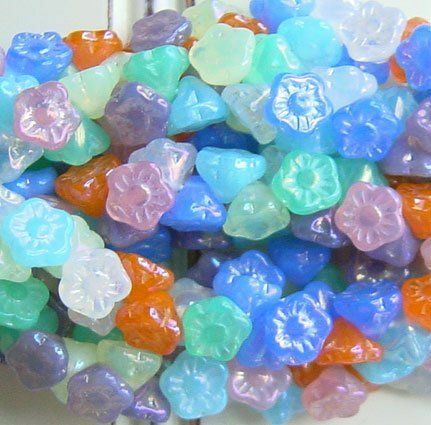 What’s your favorite style of flower bead? How do you like to use them in your designs? Actions you take from this post may result in a commission for Inspirational Beading. Our latest bead giveaway has come to a close! Thank you so much to everyone who entered, and to Harvey at The Big Purple Barn for sponsoring the giveaway. Our winner was Abigail, who chose Antique Uranium Glass Spacers as her favorite beads from the shop. 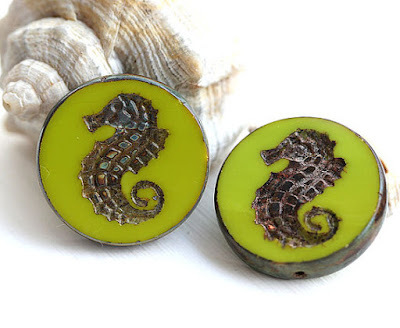 They are definitely a perfect example of the uniqueness in salvage and recycled glass beads. Uranium glass – sometimes referred to as Vaseline glass – was very popular in the first half of the 20th century. The uranium additives were used to achieve particular colors, but also gave the pieces the ability to glow under a black light. Production waned with the scarcity of uranium, turning the (minutely) radioactive glass designs into valuable collectables. 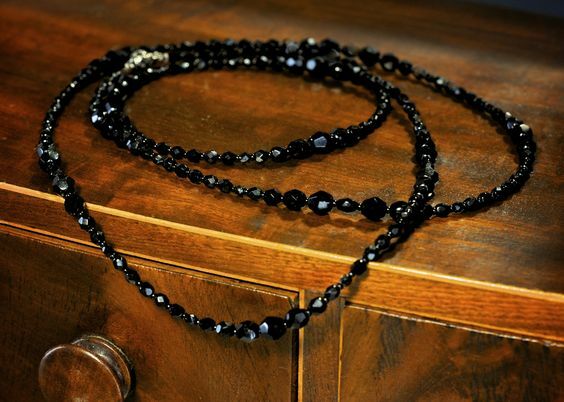 Inspired by the vintage appeal of these beads, I went on a hunt for some Jazz Age jewelry tutorials. 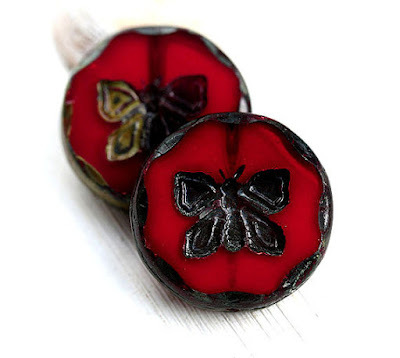 Some of these could probably be adapted to include lampwork beads – either way, they’re fabulous. I was really hoping to find some projects inspired by Miss Fisher’s Murder Mysteries, but I couldn’t seem to find any. Since I’m halfway through my second viewing of the series, I might have to come up with my own! What’s your favorite art deco jewelry style? For many months now I’ve been saying that I have to use up some of my accent beads. Over the last couple of years I have amassed a pretty great collection of beads that I love and love to use, but I recently reached a point where I just didn’t know where to begin. I’ve long since passed the hoarding stage and am ready to see what my beads can do. I just never have an idea that I think is good enough. I’ve been taking beads out, trying them on different palettes, imagining what they can do, but never really getting down to making something with them. I’ve also been busy with tutorial projects and other pursuits, so I haven’t been concentrating on just making jewelry for fun. I decided it was time to do something about it. I was looking through old photos for something or other when I started reminiscing about some of my favorite creative challenges. Although the Egyptian Gods challenge was by far the most rewarding for me, the early marathons like A Ring a Day and A Bracelet a Week were the ones that taught me the most overall. Like the Destash Challenge, they also helped me to stretch out my limits and use up things in my bead stash. I did try out a new challenge at the start of this year, but it fizzled out. I thought that I would end up going without for the rest of 2016, but a marvelous idea finally emerged. For the remainder of 2016, or until I’ve used all of my small accent beads at least once, I’m going to make a mini collar every week. I chose mini collars because they stitch up quickly, and I’d really love to have a few more of them for my shop, which I’ve been neglecting lately. Although the chevron chain design that I use for them is pretty simple, there are lots of different ways to add patterns and highlight exciting beads. I can’t wait to start experimenting! To kick off the challenge I used a couple of old favorites – lime green and cobalt blue Indonesian glass spacers. In order to include these large-hole beads in the design, I ended up increasing the stitches quite a bit to make room for 8/o bumpers. The netting is roomier and the collar is much bigger overall than my usual designs. I’m really happy with results, because it means that I can take more chances with other accents as well. Plus I love the palette with rainbow patriot blue for the netting. Next I’m going to try out some drops or magatamas, and perhaps a new pattern. Wish me luck!